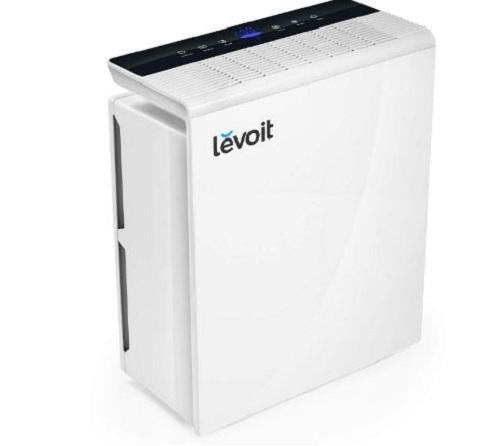 The LEVOIT LV-PUR131 is an energy saving air purifier that covers an area of up to 322 square feet making it ideal for medium and large rooms. Through a 3-stage air purification process it removes 99.97 percent of dust, pollen, smoke, allergens, pet dander, mode spores and odors. The HEPA filters capture particles as small as 0.3 microns, making the air purifier a great addition to homes with allergy sufferers. The air purifier has a convenient smart auto mode that automatically selects the best fan speed depending on the air quality. ​You can also tell how dirty your indoor air is using the integrated air quality indicator. It produces minimal noise while operating and doesn’t produce any ozone, making it environmental friendly. Read on for my full review. If you are looking for a HEPA air purifier that can cover a larger space, see our in-depth HEPA air purifier buying guide for the best recommendations. 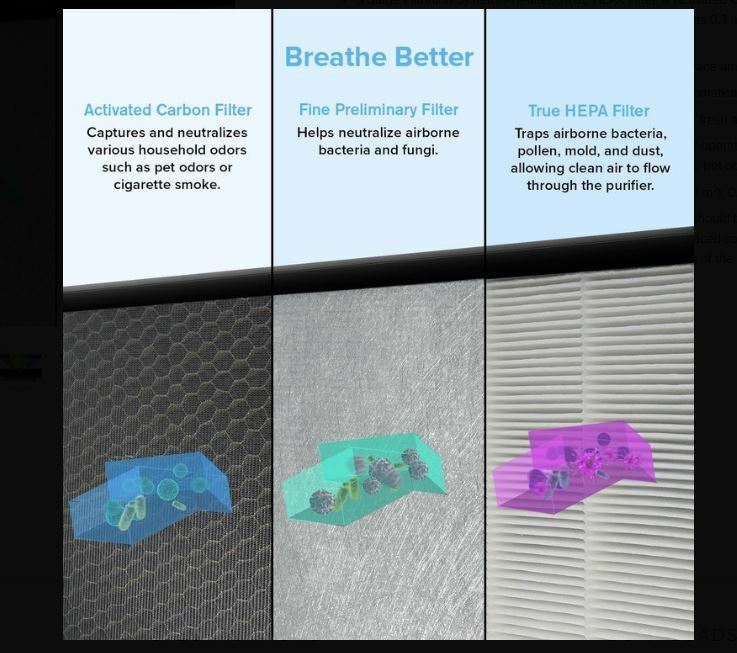 You need to change the filter frequently especially if you live in a high-pollution area. To remove as many impurities as possible, air goes through three filtration stages before it is released back into the room. 1.Fine preliminary filter – this is where bacteria, pet dander, mold and fungi are trapped. It is located on the other side of the true heap filter. 3. Activated carbon filters – This filter takes care of lingering odors around the house including tobacco, smoke and cooking smells. 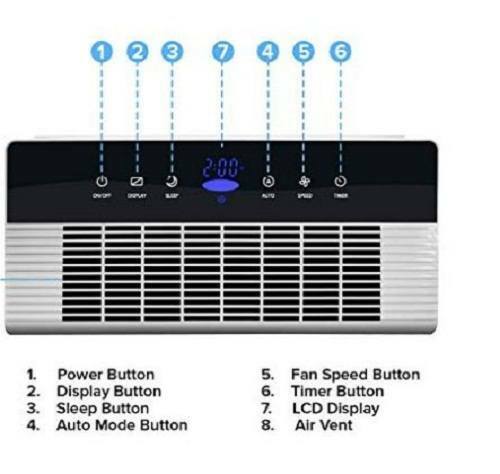 The automatic sensor adjusts the air purifier’s fan speed according to the current air quality. 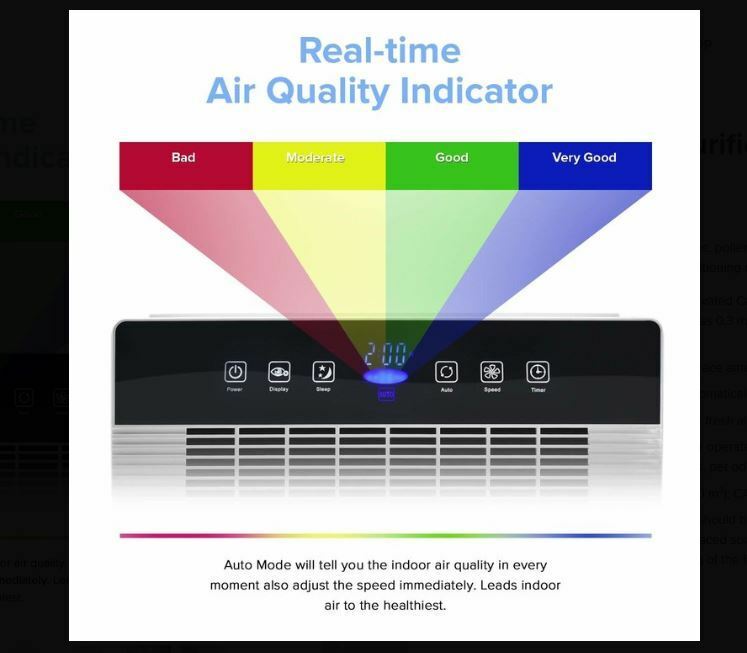 An integrated air quality indicator uses different colors to tell you how clean or dirty your indoor air is. Red color means dirty air, yellow color means moderately clean, green color means the air is clean enough for breathing while blue which means air is very clean. If you start cooking something or your pet makes a mess on the litter box, you’ll notice the light turning to yellow or red. You’ll also hear the fan pick up speed as the air purifier tries to clean up the air. Air purifiers that generate negative ions to sanitize the air also produce some Ozone, which is not so good for your health. 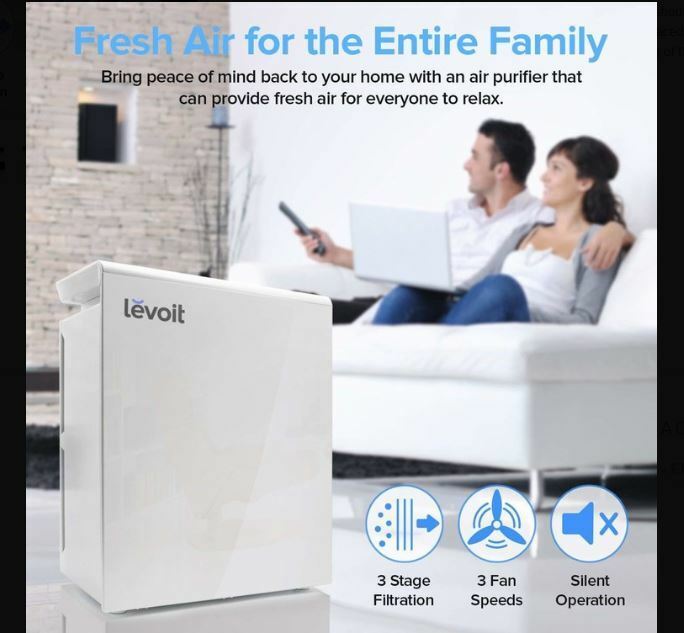 The LEVOIT LV-PUR131 Air Purifier is 100 percent ozone free. This makes it environmental friendly and safe to use. 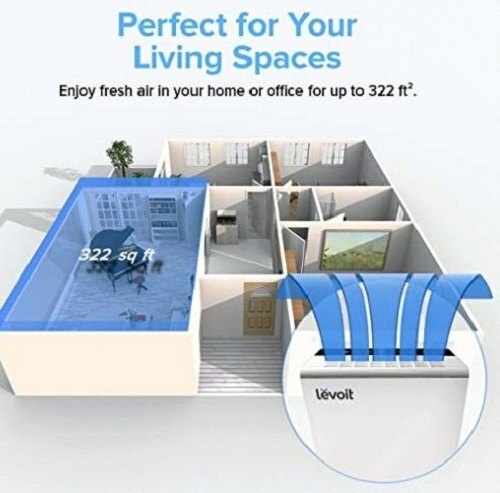 The LEVOIT LV-PUR131 Air Purifier is designed to cover medium and large rooms. It can quickly (less than 10 minutes) clean all the air in a room of up to 322 square feet. It’s great for living rooms, bedrooms, home offices and nurseries. The timer allows you to programme the air purifier to run for up to 12 hours. This saves you the trouble of having to keep switching the air purifier on and off especially during the day when activities like cooking pollute the air. The timer is also great for nighttime use. If you don’t want to leave it on all night, you can set the timer for a period like 5 hours. 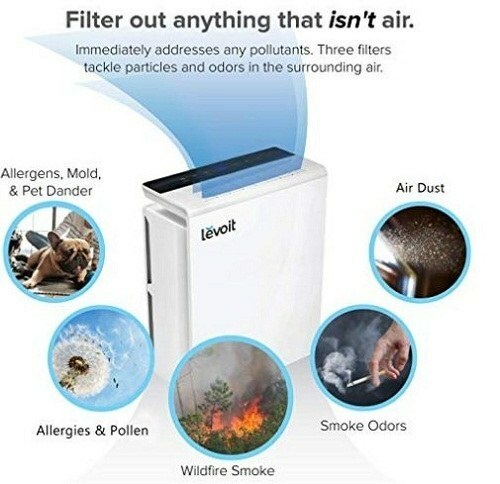 The main limitation of this air purifier is the too-frequent air filter changes.The filter is supposed to last 6 months but often lasts for less time. If you live in an area with lots of pollution (e.g. during wildfire season), you might have to buy a new filter every 2-4 months. But at least the filter replacements are not too pricey. If you have a pet at home, it’s challenging to find an air purifier that actually works. This is especially the case if you have allergies and are very sensitive to pet fur and dander. The LV-PUR131 works as advertised. 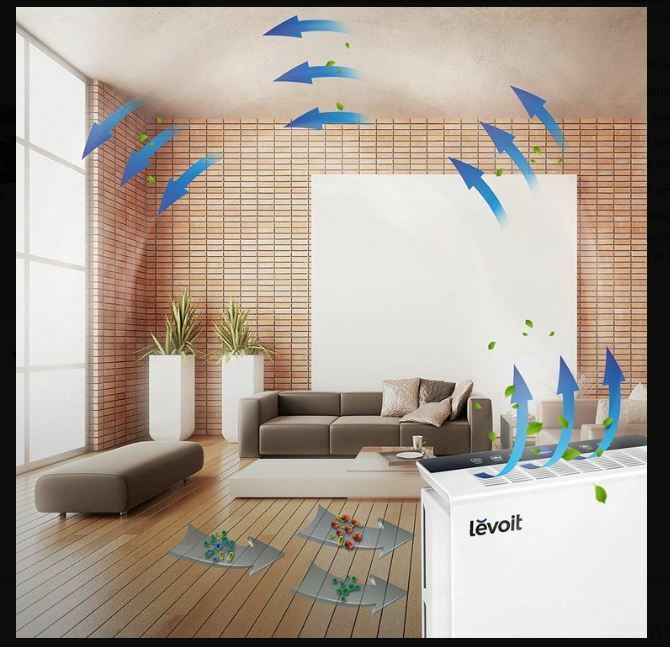 Using an efficient 3-stage process, which includes HEPA filtration, it removes common allergens and pollutants including the extra-tiny ones that escape most purifiers. You do have to change the filter often but it’s a small price to pay for clean allergen-free air.